Rival fans branded us ‘Penalypool’ for all of last season. Strangely, to me, they meant it as an insult, or at least as a way of diminishing our achievements. Of course, those attacks reached hilarious proportions, when we were awarded three penalties in the same game against United at Old Trafford. The fact that it was Mark Clattenburg, who pointed to the spot, only served to fuel the conspiracy theorists claims. What our critics fail to realise, is that you have to get in, or sometimes barely inside, the opposition box to win a penalty. Then you have to score the damn thing. People who claim the Reds were only successful last time out because of the unusually high number of penalties they won, ignore the fact that many of those penalties were very high pressure situations. Take Gerrard’s winner against Fulham, as a case in point. What must have been going through his mind, as he stepped up to dispatch the spot kick? His legs must have felt like lead weights, his thoughts scrambled and fragmented. If he misses, the title is gone. If he scores, then there was every chance the Holy Grail would be coming to Anfield. To maintain composure, and score, under those circumstances, takes incredible skill. The same was true against Ludogorets in our Champions League opener. Here we add the fact that the team had just conceded seconds earlier, after leading. The game was almost up, and Liverpool were staring at a draw that would seem like a defeat. Again the skipper showed he had ice in his veins, and the unerring skill to put the ball away. So is there anything particularly special about Liverpool and penalties? Or, is it all just sour grapes and bitterness? History suggests that, actually, when it comes to penalty shootouts, our club seems to have, either been leading a charmed life, or has this skill honed to fine art. We have actually maintained our superiority in this area for forty years. Last night, as the players raced from the centre circle, to embrace Simon Mignolet, they were probably unaware that this was the 12th time in 14 penalty shootouts, since 1974, that Liverpool had been victorious. Think about how many times the squad, or the manager have changed in that time, and you can’t help but be impressed, at how we have maintained that record. What a remarkable achievement. How can we explain this? Does the team practice penalties? Do our penalty takers have unique qualities, that separate them from their counterparts? Are we just jammy, as the Blues and Mancs would suggest? Whatever it is, you can be sure they would like to get their hands on it, as would every England manager in the last half century. Far from being a source of embarrassment, our superiority, in the field of the penalty shootout, is something to marvel at. We are leaders in this area. The German national team are rightfully proud of their prowess from the spot. We should be too. For the sheer importance of the result, Istanbul will always eclipse all other penalty shootouts for me. The reds hadn’t won a European Cup since 1984. We had stood on the brink of annihilation, and had clawed our way back. Then with legs like liquorice, and tired minds, the boys lifted themselves one last time, to vanquish Milan from 12 yards out. It was the stuff of legend, and will be forever more. 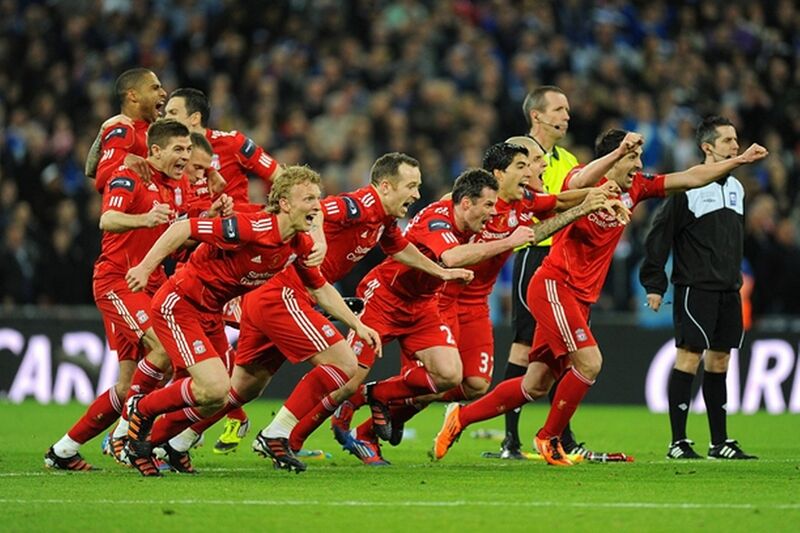 This was Liverpool’s fourth European Cup final. By this stage Reds like me were becoming a bit spoilt. We, or at least I, kind of took success for granted. Of course we were in the final, and why wouldn’t we be, we were Liverpool. However, there was an edge to this. This was Rome, and we were up against Roma, on their home turf. It was a tight game, and when it went to penalties my heart sank. Would our lads have the nerve to see this out, in the Italians own backyard? When Stevie Nicol missed the first, it felt like our fate was sealed. What Grobbelaar did on the line that night, would later inspire Dudek in Istanbul. The sight of the utterly mad Barney Rubble, doing the craziest celebration ever, after tucking away the winning penalty, will live with me forever. This will be controversial. Let’s face it the game, in terms of importance, doesn’t rank highly in the grand scheme of things. A League Cup game, in the early rounds, can hardly compete with a cup final, like say the 2006 Stevie Gerrard Cup Final. I could have gone for sentiment. I took my son to his first cup final against Cardiff, at Wembley in 2012. The look on his face when Gerrard, the other one, missed the last spot kick brought a tear to my eye. Sometimes you can miss the truly remarkable, by focussing on your own narrow perspective. That’s why for me, what happened last night, has to rank as one of the greatest penalty duels in the last forty years. Regardless of what was at stake, the sheer drama, tension and skill on show, deserves to be recognised. It was like a great rally at Wimbledon. As each of our penalties went in, you prayed that ‘Boro would miss the next. They didn’t, and the pressure was straight back on. I was sick with nerves, and the sense of relief, at the end, was every bit as palpable as any of our cup final victories.